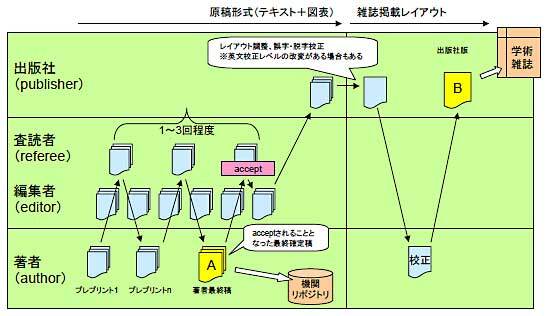 If you, as the author, exclusively hold the copyright, you can deposit your article in KURENAI. If you and your co-author(s) hold the copyright, you and all the co-authors need to agree to deposit the article in KURENAI. Does the publisher permit self-archiving in the institutional repository? If you want to deposit and make open access your article that has been accepted by or published on an academic journal, or your book that has been published by a publisher, you need to check the publishing contract. The terms and conditions regarding self-archiving may be stated in the contribution rules, copyright rules or copyright transfer agreement. Many publishers announce their copyright rules on their website, usually in a section such as "Copyright", "Permissions", "For Authors", or "Rights". ●Has the copyright been transferred from the author to the publisher? If so, to what extent? ●Is it permitted to deposit and make open access the article in the institutional repository? ●If so, which version of the article can be deposited? Many publishers permit to deposit in the institutional repository the "final author's manuscript", but NOT the "final publisher version". Some publishers permit depositing the article in the institutional repository no sooner than a designated period after the publication.